If you don’t have any credit established, you might know that trying to do so is kinda a tricky situation. In order to qualify for the best credit cards, you need to have an established credit history. But how can you establish your credit if you don’t qualify for a credit card to get started? If you’re trying to figure out how to start building your credit and apply for your first card, you’re in the right place. We’re going to take you through the steps you need to take for your credit to start reporting. Then, we’ll give you our picks for the 7 best credit cards for no credit so you can get started. Why isn’t Your Credit Reporting? There’s a couple of different scenarios you could find yourself in where you’d be in the position to build your credit from scratch. No one is just assigned a credit score once they turn 18. It takes work to establish one. Maybe you’re a student just heading to college who has never thought of the importance of their credit score before. But, now you want to get a car loan or buy some expensive electronic equipment which would require financing. You’re just now realizing that you need to work on your credit. You did start building your credit when you were young and had an established credit history. But, things got tight and you couldn’t afford to keep paying. In the end, you ended up filing bankruptcy. If this is the case, you’ll have to wait until your bankruptcy is discharged. Then, you’ll be able to start building it back up again. Remember the saying, “If you don’t use it, you lose it?” The same applies when it comes to your credit score. If you’ve gone months or years without using your credit, you’re basically going to have to start from scratch again. No matter how you got there, you need to charge ahead and take back control. So your credit isn’t reporting, what’s up with that? Keep in mind that no one has a credit score of 0, it just isn’t possible. Credit scores range from 300-850. So why would yours not show up? You have not been listed on any credit account. It’s important to note that if you recently applied for credit, it’ll take a few weeks before you’ll see it reflected on your report. So don’t freak out if you apply for a card and it’s not showing on your report the next week. You’ll come to realize that everything revolves around having credit. So getting started at an early age and being aware on how to manage your credit is imperative to your financial success in the future. Looking to lease an apartment? Finance a new car? Things like these require credit checks and an established credit profile. So, you better prepare yourself for rejection if you can’t show your lender a positive credit history. Even potential employers are doing credit checks as part of their hiring process now. Don’t lose your dream job over your lack of credit score. The credit bureaus will start to take notice as you begin to build credit. Once they have enough information, they’ll be able to generate your credit report. So how do you introduce yourself to the credit bureaus? Credit Building Loan: When you get a credit building loan, the financial institution will put a deposit into a secured account. Then, you’ll start making monthly payments towards the loan. As you pay on time, it’ll be reported to the three major credit bureaus. Thus, creating a responsible payment history which the bureaus will use to calculate your score. Secured Credit Card: A secured credit card involves you placing a cash deposit into an account. Your credit limit will be the amount of this deposit. You’ll be able to use the card just like a regular credit card. So, paying on time will report to the credit bureaus and help to establish a positive credit history for yourself. Both of these are great options to start building credit. Keeping up with loan repayments on a credit building loan can be stressful. If you feel uncomfortable committing to that, a secured credit card is the best way to go. Getting a secured credit card allows to put some money on the credit line to have at your disposal. It’s easy to manage, and you’ll have all the advantages of a standard credit card. The Visa OpenSky Credit Card is a secured card which means you’ll have to put down a deposit. For this card, there’s a $200 minimum deposit. However, the security deposit is refundable once you have paid the balance in full and closed the account. The Visa OpenSky Secured Credit Card is a great credit building option because they will report to the 3 major credit bureaus every month. Use this as an opportunity to establish a good repayment history which will increase your score. The Discover it Credit Card is a secured card which means you’ll have to put down a deposit. For this card, there’s a $200 minimum deposit. However, the security deposit is refundable once you have paid the balance in full and closed the account. The Discover it Secured Credit Card is a great credit building option because they will report to the 3 major credit bureaus every month. Use this as an opportunity to establish a good repayment history which will increase your score. Plus, they’ll give you free access to your FICO score so you can see the progress you’re making. If you are able to keep up a great repayment history for your first 8 months with the card, you will be considered for an unsecured line of credit. The Capital One Platinum Credit Card is a great credit building option because they will report to the 3 major credit bureaus every month. Use this as an opportunity to establish a good repayment history which will increase your score. Your credit line will initially be $200-$300 and will be determined after a credit check. Once you’ve made 5 on time payments, it’s likely that you’ll see your credit line increase to $500. If you continue to demonstrate responsibility in the repayment of your card, you will continue to see your credit line increase. The Capital One Journey Student Rewards Credit Card is a great credit building option because they will report to the 3 major credit bureaus every month. Use this as an opportunity to establish a good repayment history which will increase your score. Additionally, you’ll see your credit line increase after you make on time payments for the first 5 months. The Capital One Secured Mastercard is a secured card which means you’ll have to put down a deposit. For this card, you can start with a deposit as low as $49. However, the security deposit is refundable once you have paid the balance in full and closed the account. The Capital One Secured Mastercard is a great credit building option because they will report to the 3 major credit bureaus every month. Use this as an opportunity to establish a good repayment history which will increase your score. Plus, you’ll see an increase in your credit line after making on time payments for the first 5 months. 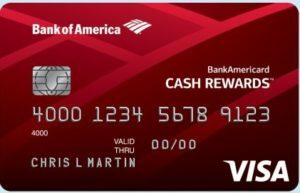 The Bank of America Cash Rewards Card for Students is a great credit building option because they will report to the 3 major credit bureaus every month. Use this as an opportunity to establish a good repayment history which will increase your score. One of the best things about this card is that you’ll earn cash back on your purchases while building your credit. The Discover it Student Cash Back Credit Card is a great option for students because you’ll receive a $20 statement credit each year if you have a GPA of 3.0 or higher. This opportunity will be there for the first 5 years that you have the card. So you’ve completed the application and you have your new card in your hand. What can you do to make sure you’re building a positive credit history as quickly as possible? Make sure you understand how your credit score is calculated. Keep your credit utilization ratio under 30%. That means you should never have a balance which is over 30% of your total credit limit. The lower your credit utilization ratio, the better. Only use your card for purchases that you can repay in full at the end of the month. When you’re first starting to build credit, this is extremely important. Make your payments on time. This is the biggest contributing factor to your credit score. After all, it makes up 35% Just by doing this one thing right, you’ll see the biggest difference. Set up auto-payments. If you can’t do that, make sure your email alerts are on so you’re aware of when your bill is due. If you don’t use it, you lose it. Make sure you’re consistently using your credit. Building your credit from scratch will take months to do. It is a process and you need to be patient. Make sure you keep up with those monthly payments, they are the most crucial to building your credit. After you’ve had 6-12 months of on time payments, the three major credit bureaus will have enough of a baseline to establish a payment history. No matter if you’re new to the credit game, or trying to get back in it, you should take advantage of the options we’ve laid out. The sooner you start working on rebuilding your credit, the easier it’s going to be to qualify for that next big purchase. Do you have any tips and tricks that helped you build your credit ? Let us know in the comments!